It's time for my July favourites and this month, I've included an extra lifestyle/gym product for good measure. Here's what I've been loving lately! I usually like to stick to all beauty products in my monthly favourites, but I've been so impressed with this product from Activbod that I just had to include it. 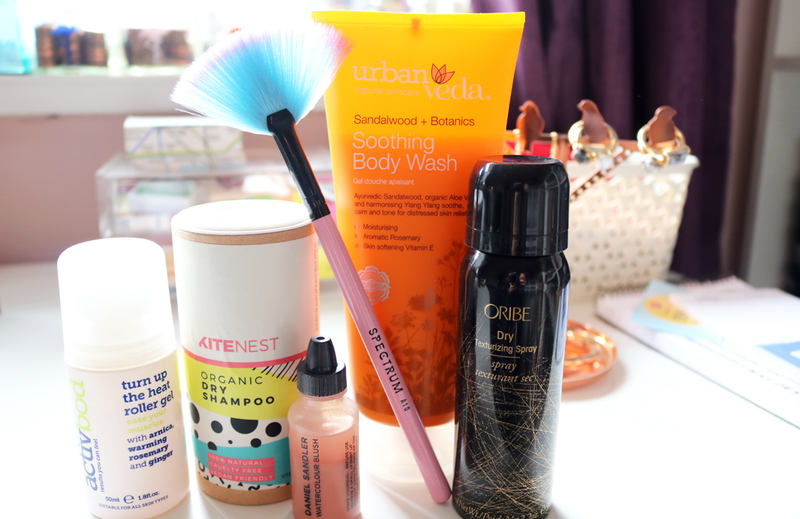 I discovered it in a Fitty London box that I recently reviewed for All Subscription Boxes, and it's awesome! It's basically a roller ball gel that you apply to any aches and sprains after intense workouts and it contains ingredients such as Arnica, Rosemary, and Ginger to warm and soothe aching muscles. I do a lot of Pilates and Yoga so this really helps if I've overstretched something! I use a lot of dry shampoo in the warmer Summer months to freshen up my hair in between washes and to keep excess oil at bay, and this new one from British brand KiteNest is one of the best that I've tried in a long while. It's 100% natural, cruelty-free and organic, and it's also talc-free which is really interesting to see in a dry shampoo. Instead, it uses a blend of clays and natural powders to soak up any grease and dirt, and there are also some essential oils in the formula which makes my hair smell lovely and fresh. There are two types available; one for Light Hair tones and one for Dark (I've got the latter) and it really works a treat without leaving a white or ashy/grey cast. Definitely a brand to look into as they have some great eco-friendly ethics. A few weeks ago, I decided to 'shop my makeup stash' and in the process, I rediscovered a lot of favourite products that I'd been neglecting. One of them was this beautiful Watercolour Liquid Blush from Daniel Sandler. I've got a couple of these in various shades, but my favourite is definitely Angel, which is so pretty and suits practically all skin tones. It has a hint of shimmer in it so it's perfect for a little Summer glow on the cheeks. From this month's Glossybox, I've been loving this super cute Fan Brush from Spectrum. Not only do I love the colours, but the synthetic bristles are wonderfully silky soft on the skin and it applies powder highlighter exactly where you want it, plus you can use it to apply setting powder underneath the eyes without it upsetting your concealer. I need to pick up some more of these Spectrum brushes ASAP! The scent of this body wash is just heavenly. It's packed full of natural essential oils such as Sandalwood and Ylang Ylang, and the SLS-free formula is really moisturising too. Fantastic for dry skin that needs a soothing pamper in the shower. Lovely stuff indeed. Yes, it's ridiculously overpriced (luckily I snagged this in an awesome GWP! ), but I've still been unable to find anything that works equally as well for my flat-as-a-pancake fine hair, as this bad boy does. I use it very sparingly and thankfully I don't need much to guarantee a good hair day every time I use it. If you haven't tried it yet, you need to. Just take my money Oribe! What are your beauty favourites this month?